I first found out about Royce Chocolates when my friend K brought me some from the Philippines more than a year ago. And ever since, it has become my favourite. I'm so sorry Crunch, but Royce Nuttty Bar Chocolate is a lot better than you. And maybe, it's also healthier. It's a Japanese chocolate after all. But then again this is just my own justification from eating three bars in one go. When I went home in January, my friend Joy bought me some. They were about P1,500 for a box of 18, I think. It's not too bad for a luscious chocolate. And yes, it looks really posh- how it's wrapped and everything. This is the Nutty Bar Chocolate which is my favourite. It is crunchy, nutty (as it says) and not very sweet. This is why I like it very much. Another Royce chocolate that I love is the Amande. Actually, my friend K is my biggest (junk) food influence. She has introduced me to most of the (junk) foods that I eat nowadays. 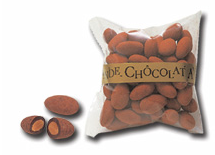 Just like Amandinas, which she buys from France, Amande is made of roast almonds coated with Royce chocolate. There are three flavours, but I prefer the Black Amande Chocolat. I brought some too, but it was gone in two days! I am not sure how much they are. But if I can remember it right, around P500. 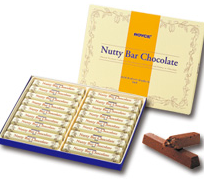 Royce Chocolates are available in most Asian Countires.